The saddleback caterpillar is stunningly beautiful, but it is most likely to impress its presence upon you with a devilish sting. If you innocently brush against one where it hangs on the underside of a leaf, you will be punished with an intensely burning welt for several minutes at least. Perhaps you can forgive its cruelty as you marvel at its vivid color and otherworldly form. 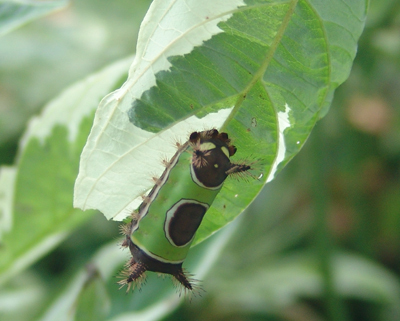 The caterpillar’s common name refers to the brown, saddle-like blotch in the center of its rich kelly green back. Each end is capped with reddish-brown and bears a pair of imposing bristly “horns.” The head is moustachioed with additional spines and the tail end bears large white eye spots reminiscent of spiderman’s. Both sides of the abdomen are lined with yet more spines. 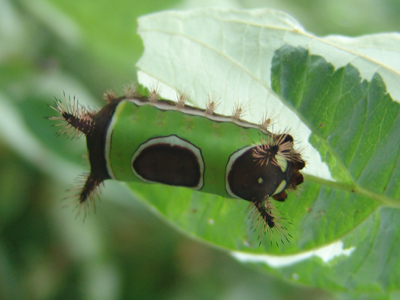 The saddleback caterpillar is the larva of a fairly inconspicuous brown moth. The species, Acharia stimulea (formerly Sibine stimulea), is native to the eastern United States. You are most likely to encounter the caterpillar in August and September. I have found them on roses, Itea, shrub dogwoods, and Carex, but they are documented to feed on dozens of common garden plants. It’s beautiful enough. I’m wearing gloves in the garden anyways. What sort of critter eats IT? I have also wondered what eats these but haven’t been able to find a thorough answer. I did learn (from a paper on the Ecological Society of America website) that generalist predators like assassin bugs and lacewing larvae prefer to eat non-spiny caterpillars, and paper wasps even learn through experience to avoid them. But that implies that they aren’t ignored 100% by those and other usual predators of caterpillars. Also, some species might PREFER to parasitize the stinging caterpillars because they are less likely to be eaten before the parasite babies get their fill and move on. I was on the stinging end of one yesterday and have been trying to find out it’s identify. I was bite by one five times yesterday. I thought it was a thorn. Ouch. I have brushed against one a couple times in a row, too, before I realized what it was. Thankfully they don’t “bite”, but the poison from those stingers feels at least as bad as a cut. I hope it was some consolation that it was more beautiful and interesting than a thorn. I first encountered a saddleback caterpillar about 15 years ago, before there was an Internet to find out what it was. I finally found it in an insect book weeks later. It had a lot more bristles that the one shown in the photo above. An Internet search on the name will find you a photo of the bristly one. I merely brushed against it with my bare shoulder and it felt like I had been stung by 5 wasps, all at the same time. The skin died in a streak on my shoulder and took a couple of weeks to heal. These are bad bugs! Did it look like this?– http://www4.samford.edu/schools/artsci/biology/zoology/invertzoo-05f/pages/24.htm I have watched some captive caterpillars “grow into” their hairs, so when they’re young the bristles are much larger relative to the rest of their body. I wonder if the poison similarly dilutes as the whole body mass grows? I have been fortunate to never have any visible damage after the swelling goes down, out of the 6 or so times I’ve been stung. Perhaps some populations/subspecies are naturally worse? Ohhhh I JUST had a run in with this TINY nasty critter and Im in FL and its august. Oddly it was on a metal pole of a pony cart and I grabbed the pole to move it, OUCHHHH Felt like WASP stings, its that bad. Ive done the ice and the benadryll and now have glops of a backing soda paste on my finger n palm, Its been 45 min and its just starting to let up a little, but all is RED, The FOE sits in a jar next to me. I also red on the FL edu site to put scotch tape on the area first and repeadedly peel off to remove the UNSEEN bristles. This things are EVIL, VERY TINY, pretty, but EVIL. Ive lived in FL all my live and this is a first and I hope a last run in with this thing. And yes much more bristly than pic. I saw one of these catepillars on bing’s welcome page today. I was in the yard talking to a neighbor, put my hand on one of our metal fence posts. And one of these Saddleback Catepillars. I’ve done the washing, the tape thing, ice and creams. That was about 3 hrs. ago and it still stings. I gave it to a boy down the street for science class. Turns out he needs 20 bugs for Science Class. I had never seen one of these before. I hope next time I SEE it first. I was stung by one early Monday morning Sept. 8, 2014 as I attempted to carry by trash to the curb for pickup. That did not happen after the sting. I quickly went inside and bathe my wrist with Listerine mouthwash and then applied cortizone crème. I been in rural areas as a hunter and a gather, but have never seem this one before. The sting was more painful than a bee or wasp. It has gain my respect.